Not all warbirds have stars and bars. This original Waco UPF-7 represents the finest example of the Civilian Pilot Training Program, which trained thousands of pilots for military service during World War Two. This rare Griffon powered Seafire, owned by Dr. Wes Stricker and restored by Jim Cooper, is catapulted into the headlines after its debut at AirVenture 2010. 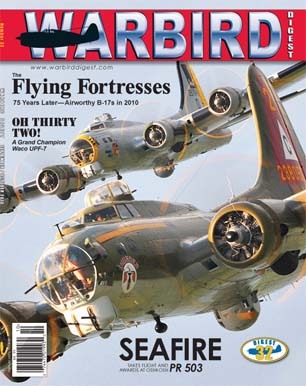 Historian Scott Thompson expertly chronicles everything you need to know about surviving, flyable B-17s. While other large metropolitan air shows decided to cancel their 2013 events due to the absence of military support, the team at Thunder Over Michigan buckled down and persevered, resulting in another fantastic show. Air show director Kevin Walsh shares insight about what makes a successful show. At the time Art Kemp was just doing his job to the best of his abilities. Worthy of Hollywood, the details of one amazing mission perfectly illustrates the horrors of aerial combat between the men of the Eight Air Force and the German Luftwaffe. Celebrating the 75th anniversary of the greatest cargo and transport aircraft of the propeller age, the world’s largest gathering of Douglas DC-3’s and related variants converged on Whiteside Airport in Rock Falls, Illinois.